Beatriz P. Monteiro, DVM, is a PhD candidate in pharmacology at University of Montreal in Montreal, Canada, where she received the Vanier Canada Graduate Scholarship. She earned her DVM from São Paulo State University in Brazil and completed 2 small animal internships at University of Guelph. Dr. Monteiro has authored over 30 articles, collaborated on several book chapters, and spoken at international meetings. She participated at the North American Pain School and joined the board of directors of the International Veterinary Academy of Pain Management and the WSAVA Global Pain Council. Her research focuses on the assessment and treatment of chronic pain in dogs and cats. Luna, a 15-year-old, 8.6-lb (3.7-kg), spayed domestic shorthair cat with stable International Renal Interest Society stage 2 chronic kidney disease (CKD), was presented for evaluation of an enlarged right rostral mandible, decreased appetite, halitosis, and dysphagia of approximately a month’s duration (Figure 1). The owners also reported recent changes in behavior: Luna had become irritable and could no longer jump onto windowsills. On presentation, Luna was quiet and shy. Vital parameters were within normal limits (temperature, 100.8°F [38.2°C]; pulse, 160 bpm; respiratory rate, 36 breaths per min). She was subclinically dehydrated (5%), and her hair coat was greasy. The right submandibular lymph node was enlarged. BCS was 3/9, which was similar to previous visits, with apparently stable body weight. Systolic blood pressure was 140 mm Hg (reference range, <150 mm Hg). Because Luna refused to walk, mobility could not be assessed. Oral pain was assessed through gentle palpation of the mandible. Luna showed signs of hyperalgesia (ie, increased pain sensation to a painful stimuli) and clear avoidance of palpation while hissing at the clinician. Because osteoarthritis (OA) was suspected, OA-related pain was assessed using the Client Specific Outcome Measures instrument (see Suggested Reading),1 which consisted of choosing and scoring 3 activities that were specific to Luna (ie, jumping onto the kitchen’s window sill in the morning, using the litter box after breakfast, jumping onto the bed in the evening). Luna performed these activities with severe, mild, and moderate difficulty, respectively. Although there is currently no validated instrument to assess quality of life that is freely available to veterinarians, a general quality-of-life assessment was performed by evaluating Luna’s ability to perform daily activities, appetite and grooming habits, and social interactions and temperament.2,3 Because Luna was showing progressively decreased levels of activity and socialization, it was determined that her quality of life was moderately affected. CBC and serum chemistry profile results revealed mild anemia (hematocrit, 25%; reference range, 28%-47%) and elevated BUN (42.6 mg/dL; reference range, 11.5-30.2 mg/dL) and creatinine (2 mg/dL; reference range, 0.4-1.9 mg/dL) levels. Urine specific gravity was 1.029 (reference range, ≥1.035), symmetric dimethylarginine was 15 μg/dL (reference range, 0-14 μg/dL), and total thyroxine was 1.6 μg/dL (reference range, 1.0-4.4 μg/dL). Do you use NSAIDs as part of long-term pain management in cats, including those with stable chronic kidney disease? Luna was anesthetized for additional diagnostics. Premedication was administered intramuscularly with a combination of acepromazine (0.02 mg/kg) and buprenorphine (0.02 mg/kg). Thoracic radiography and abdominal ultrasonography were performed with the patient under sedation and revealed no evidence of metastasis. Approximately an hour after premedication, general anesthesia was induced with propofol (5 mg/kg IV) and maintained with isoflurane (1.2%-1.3% expired concentration delivered in 100% oxygen using a nonrebreathing circuit). Intravenous fluids (3 mL/kg/hr) were also administered. 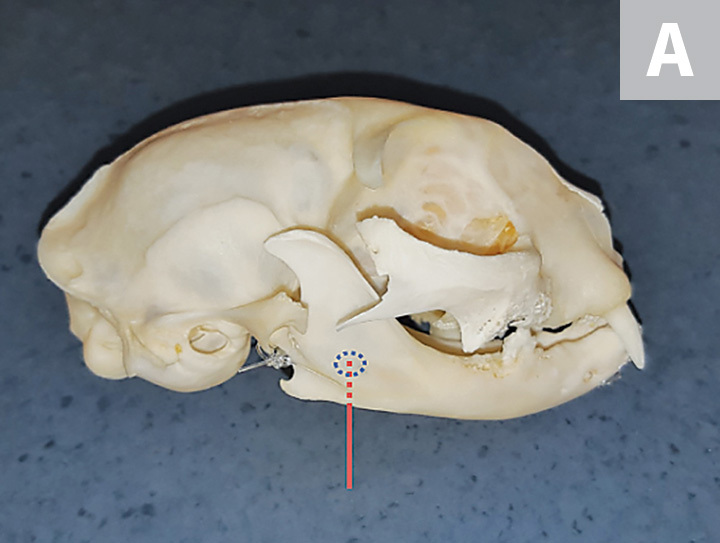 A firm mass (1.2 × 2 cm) was identified on the right rostral mandible. Oral radiographs revealed marked osteolysis and periosteal proliferation. An inferior alveolar (mandibular) nerve block was performed using bupivacaine 0.5% (see Local Anesthetic Technique for Nerve Blocks). An incisional biopsy was performed at the junction of normal and abnormal tissues and submitted for histopathology. No attempts were made to surgically remove the mass, as the owners did not want to perform any invasive procedures and wished to only confirm diagnosis. Histopathology results were consistent with squamous cell carcinoma. 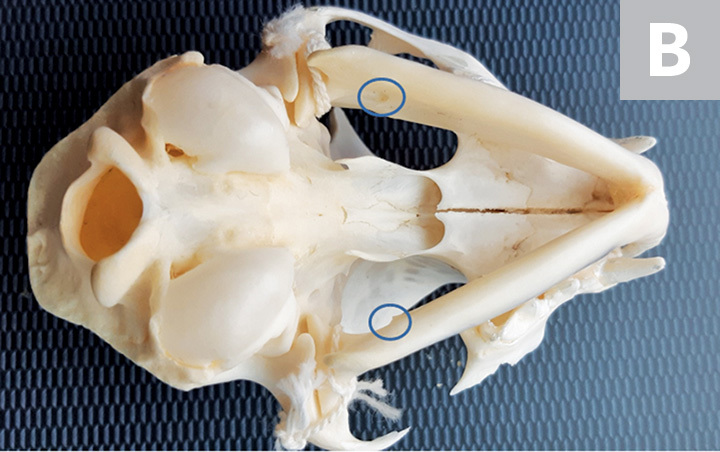 FIGURE 2 Right lateral (A) and ventrodorsal (B) views of a feline skull to demonstrate the inferior alveolar (mandibular) nerve block technique. The technique should be performed using 27- to 30-gauge, 12- to 16-mm long needles, and a 1-mL syringe. The area of injection of the local anesthetic is indicated by the dotted blue circle. For the extraoral approach, the needle (represented by the red line) should be inserted perpendicular to the ventral margin of the mandible, with the bevel of the needle directed toward the medial aspect of the mandible. The local anesthetic should be injected close to the inferior alveolar foramen on the medial aspect of the mandible (solid blue circles). Prior to injection, aspiration should be performed to confirm that no intravascular injections are being performed. The local anesthetic should be injected slowly, and no resistance should be felt. Opioids are safe at clinically acceptable dosages and are excellent analgesics.4 The combination of opioids and acepromazine reduces inhalant anesthetic requirements. Locoregional anesthesia with bupivacaine provides pain relief by blocking sodium channels and the consequent production and transmission of nociceptive stimuli (ie, pain transduction and transmission). Analgesia lasts approximately 6 hours with locoregional bupivacaine. Luna was hospitalized for 36 hours and maintained on fluid therapy. Pain was assessed every hour for the first 8 hours and every 6 hours thereafter using the Glasgow Composite Measure Pain Scale, which includes evaluation of the cat’s behavior and facial expressions while undisturbed.5 A pain scale score equal to or higher than 5 (out of 20) is the recommended cut-off score for intervention (eg, with buprenorphine [0.02 mg/kg IV q6h]). During pain assessment 4 hours after recovery from anesthesia, Luna was tense and crouched, with facial expressions indicative of pain, based on ear position and muzzle shape; pain score was 7/20. Thus, buprenorphine (0.02 mg/kg IV q6h) was administered. In addition, Luna exhibited a normal appetite when offered soft food, suggesting that the previously reported decreased appetite had been due to oral pain, which was attenuated by analgesic management. The owners opted for palliative analgesic treatment (see Treatment at a Glance), with the aim of improving quality of life. Treatment of cancer was declined after a thorough discussion. Chronic pain can be managed on an outpatient basis through both pharmacologic and nonpharmacologic means. For Luna, this included robenacoxib (1 mg/kg PO q24h) and gabapentin (10 mg/kg PO q12h). Tramadol (3 mg/kg PO q12h11) or amitriptyline (10 mg PO q24h) could also have been added to this patient’s analgesic protocol. Environmental enrichment tailored to the patient’s needs. In Luna’s case, this included the addition of scratch posts, toys, and condos; steps so she could have access to windows; play sessions (15-20 minutes of access to the backyard under supervision twice daily); brushing (10-minute sessions twice daily as tolerated); and administration of soft food. Nonpharmacologic therapies might also include acupuncture and/or nutraceuticals (eg, fish oil or green-lipped mussel extract, glucosamine/chondroitin sulfate, polysulfated glycosaminoglycan [extra-label]). Clinicians are advised to check local regulations of NSAID administration in their country of practice. For example, in Canada, robenacoxib can be administered once daily for the treatment of musculoskeletal disorders, and the duration of treatment can be decided on an individual basis12; however, in the United States, this drug is only labeled for administration for up to 3 days.13 If extra-label administration is performed, owners should be made aware and perhaps sign a written consent form. Luna’s prognosis was guarded to poor. Recheck visits were performed monthly. Despite pain management, disease was progressive and resulted in pathologic mandibular fractures. Luna’s quality of life could no longer be maintained as an outpatient, and she was euthanized 8 weeks after presentation (see Take-Home Messages). Oral and bone tumors cause severe pain, which can be controlled using a multimodal pharmacologic and nonpharmacologic approach. Pain in cancer patients is multifactorial and can originate from the tumor itself, diagnostic procedures, therapies, metastatic disease, and/or concomitant painful conditions. Owners should be involved in the treatment plan and management of chronic pain by administering analgesics and providing nonpharmacologic therapies. Cancer pain may become refractory to treatment as disease progresses, and pain management may no longer be achievable on an outpatient basis, requiring hospitalization. Euthanasia should be considered for cats with severe chronic pain and/or poor quality of life. Decisions should be made on a case-by-case basis. Lascelles BDX, Hansen BD, Roe S, et al. Evaluation of client-specific outcome measures and activity monitoring to measure pain relief in cats with osteoarthritis. J Vet Intern Med. 2007;21(3):410-416. Monteiro B, Troncy E. Treatment of chronic (maladaptive) pain. In: Steagall P, Robertson SA, Taylor P, eds. Feline Anesthesia and Pain Management. Hoboken, NJ: Wiley-Blackwell; 2018:257-280. Mathews K, Kronen PW, Lascelles D, et al. Guidelines for recognition, assessment and treatment of pain: WSAVA Global Pain Council members and co-authors of this document. J Small Anim Pract. 2014;55(6):E10-E68. Simon BT, Steagall PV. The present and future of opioid analgesics in small animal practice. J Vet Pharmacol Ther. 2017;40(4):315-326. Reid J, Scott EM, Calvo G, Nolan AM. Definitive Glasgow acute pain scale for cats: validation and intervention level. Vet Rec. 2017;180(18):449. 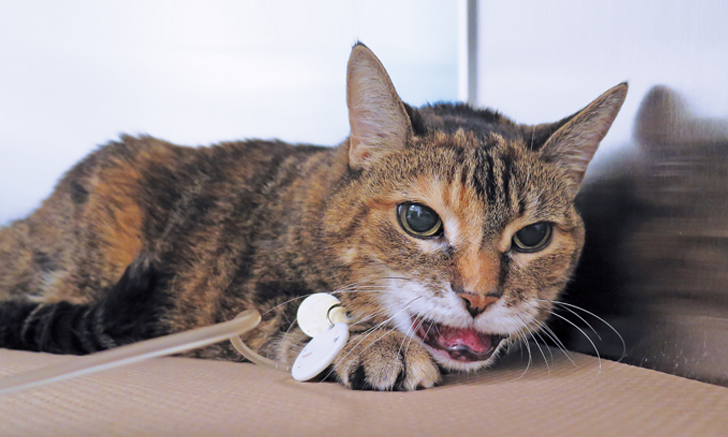 Gowan RA, Lingard AE, Johnston L, Stansen W, Brown SA, Malik R. Retrospective case-control study of the effects of long-term dosing with meloxicam on renal function in aged cats with degenerative joint disease. J Feline Med Surg. 2011;13(10):752-761. King JN, King S, Budsberg SC, et al. Clinical safety of robenacoxib in feline osteoarthritis: results of a randomized, blinded, placebo- controlled clinical trial. J Feline Med Surg. 2016;18(8):632-642. Sparkes AH, Caney S, Chalhoub S, et al. ISFM consensus guidelines on the diagnosis and management of feline chronic kidney disease. J Feline Med Surg. 2016;18(3):219-239. Guedes AGP, Meadows JM, Pypendop BH, Johnson EG, Zaffarano B. Assessment of the effects of gabapentin on activity levels and owner-perceived mobility impairment and quality of life in osteoarthritic geriatric cats. J Am Vet Med Assoc. 2018;253(5):579-585. Staffieri F, Steagall P. Local anesthetics and loco-regional techniques. In: Steagall P, Robertson SA, Taylor P, eds. Feline Anesthesia and Pain Management. Hoboken, NJ: Wiley-Blackwell; 2018:67-87. Monteiro BP, Klinck MP, Moreau M, et al. Analgesic efficacy of tramadol in cats with naturally occurring osteoarthritis. PLoS One. 2017;12(4):e0175565. Elanco. Compendium of Veterinary Products - Canada edition: Onsior. Elanco Compendium of Veterinary Products website. https://elanco.cvpservice.com/product/basic/view/1231105?key=label. Accessed November 14, 2018. Onsior [package insert]. Greenfield, IN: Elanco; 2016. https://assets.ctfassets.net/kvimhx6nhg7h/3lqYXVToVqWsgEiikumWs8/b641f1f0c40e3fe26a2c35fdc5170e69/Onsior_Tablets_for_Cats_PI_Oct_2016.pdf. Accessed November 14, 2018. North Carolina State University. Comparative pain research – clinical metrology instruments. North Carolina State University College of Veterinary Medicine website. https://cvm.ncsu.edu/research/labs/clinical-sciences/comparative-pain-research/clinical-metrology-instruments. Accessed October 10, 2018.